What do you get the person who has every scifi TV series in a DVD box set, all the latest scifi hardbacks, plus every gorgeous comic book collection and all the action figures you've ever heard of (plus probably like 20 more)? There is an actual answer to this question. You get them the books that helped create the world of SF, but which have been out of print for decades. Two indie publishers, HiLo Books and Singularity&Co., have spent the past year bringing old SF classics back into circulation. Photo of Singularity&Co bookstore via Wired. Run by io9 pal Joshua Glenn, HiLo specializes in Radium Age SF, defined as early twentieth century work (1904-1933) that came out before the Golden Age of more familiar authors from the 1940s and 50s. Glenn has been writing about Radium Age work for years now, and it's been a longtime dream for him to publish high-quality re-issues of these out-of-print gems. This year, HiLo published five books, all with fascinating introductions and gorgeous covers. They're available as print or e-books. 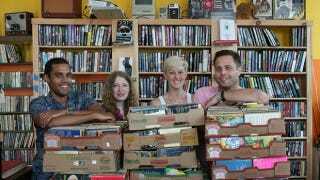 They're a bookstore in Brooklyn and a publisher devoted to one cause: "Save the Scifi!" Singularity&Co. sells select vintage science fiction and pulp books in their store and online, and also devote considerable energies to scanning out-of-print science fiction books to make them available as e-books. Spend many delightful minutes browsing their incredible selection of vintage scifi, or sign somebody (including yourself) up for their e-book club which delivers their electronic re-issues of classic SF right to your inbox every month. Or you can sign up for the "very random book of the month club," which gives you one e-book and one random vintage SF paperback every month. They even sell cool t-shirts. Bonus: io9 contributor Kaila Hale-Stern works at Singularity&Co. so stop in and say hi!